We made our first stop on our journey to find the best breakfast taco in Austin this past Monday. 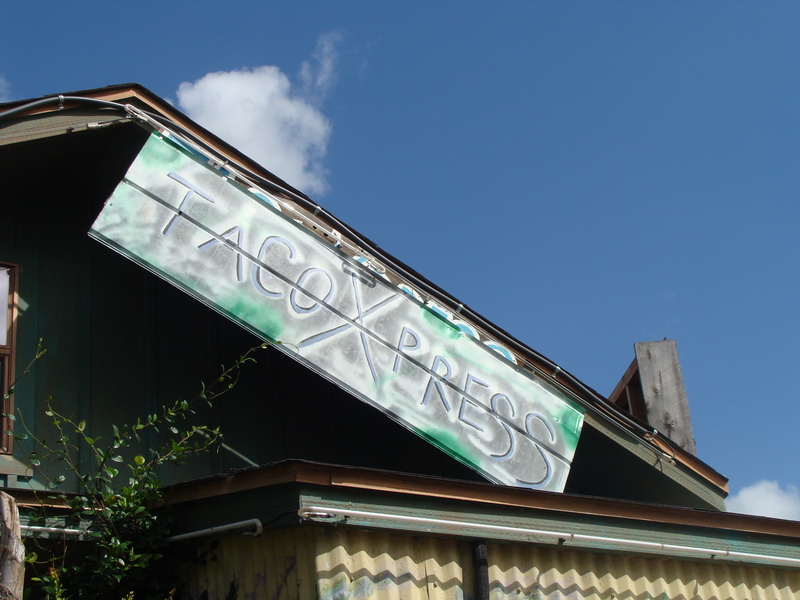 Taco Xpress on S. Lamar can’t be missed (literally), while traveling down the busy street you see what seems to be a junk yard with brightly colored objects in it (kidding…well not really). The place is definitely funky and DELICIOUS. I ordered a breakfast taco with egg, cheese, potato, and chorizo as well as a picadillo taco and horchata. Alex got two picadillo tacos as well as a barbacoa…and a friend ordered some queso that we sampled. All the food was great, my chorizo breakfast taco was definitely the best I’ve had in Austin so far (crazy right, on the first stop I’ve already topped my list of favs) and the picadillo was the perfect blend of spice and flavor. The salsas frescas were full of bright flavors and a good amount of heat. My first time trying the famed horchata was faboo. It was perfect match to a taco because it instantly cooled down your mouth after a spicy bite! And as I was telling my dining mates, it had a distinct flavor that brought me straight back to childhood. I STILL can’t put my finger on the exact spice/memory I was tasting. It’s going to drive me nuts. I wish Taco Xpress had another location because I would frequent the place…for now I’ll have to deal with making the trek down south for some yummy am snacks. Onto the next…La Mexicana Bakery here I come! 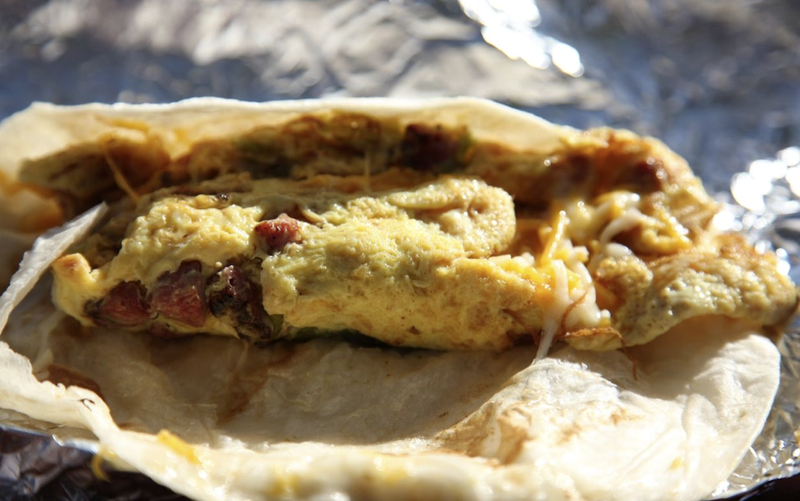 …to find the best breakfast taco in Austin. I know where to find my favorite taco in Austin but as far as breakfast tacos go they’re always just good…I want to find one that is GREAT! Places I’ve already tried that are just good are Rudy’s, Taco Shack, Jim’s, Taco Cabana (I lie, these aren’t that good), and J&J BBQ. The following are a list of places I’d like to hit that I’ve either heard have great breakfast tacos or through some extensive googling have read about their am treats! Taco Xpress is up first this coming Monday which we have off. Woot. I’ll report back! Anybody in Austin with other suggestions that I should hit up??? I had been totally juiced for the World Cup to start this month!!! Yup, too much Jersey Shore for me. During our trip to Florida I was worried we weren’t going to be able to watch much, I was wrong…our mornings started off with the 9:30 game and a cup of hot chocolate (even though it was already blazing outside). It was so relaxing and so darn exciting all at the same time! The U.S. is really impressing me this Cup, I’m so happy for them and totally stoked for us to be able to watch such exciting soccer this summer. Landon Donovan is going down in history as one of my heroes (I want to squeeze his cheeks in the above picture) and I can’t wait to watch the start of the next round starting on Saturday at 1:30pm against Ghana! This past weekend was beyond productive, I crossed off so many things from my to-do list. The act of crossing things off a list thrills the bajeebus out of me. One of the things I crossed off was eating at the Trailer Park & Eatery. We drove down to South 1st yesterday and parked in the gravel parking lot that also contains Torchy’s Tacos and Lee-Dee-Dah. I have been dying to try Torchy’s for I dunno…six months and mamma mia was it worth the wait. Alex and I both ordered two of their tacos: I got the Carnitas Pulled Pork and Green Chile taco on a double corn tortilla and the Baja Shrimp on a flour tortilla. Alex got the Jamaican Jerk Chicken with mangoes and the Trailer Trash (with fried chicken), both on flour tortillas. Each taco was served with a lime wedge and an individual sauce paired appropriately with each taco variety. There were water coolers close by so one didn’t need to order a drink, when all was said and done we paid $11.95 for the both of us. If you live in or around Austin GO GO GO GO to this place. We dubbed them the best tacos we’ve had. For dessert we skipped La-Dee-Dah to try Holy Cacao which I had heard about in Austin Monthly to sample a few of their famed cake balls. Sadly, they weren’t worth the hype and quite frankly, I’ve had better balls…cake balls that is. I had Holly’s Favorite and we both tried the Red Velvet which left a lot to be desired. The Red Velvet especially tasted as if it had been pre-made and then frozen. A no no in my book, especially when you just had a rave review in one of the city’s most popular publications. 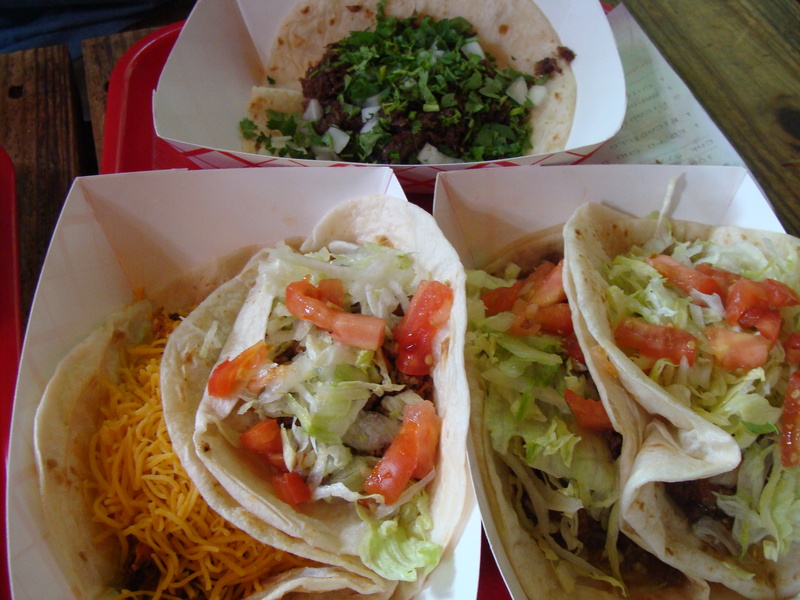 We’ll be back to Torchy’s for sure, there are various other taco combos I must try, including their breakfast tacos. It was the first time I’d ever been to a Hindu wedding at an amazing temple called Barsana Dham. The first time I went to a wine tasting. and finally, the first time I actually enjoyed sushi. If you’re in Austin go try Imperia on Colorado St. Great rolls and lots of other yummy, non-sushi choices! Friend! Definitely! But before I share my Eastern Alternative Medicine experience with you I’d like to tell all in need of a good laugh to go see Pineapple Express. Since the flick involved a lot of the same actors and makers of Superbad (which we adore) we knew we’d really enjoy ourselves. We saw it at the famed Alamo Drafthouse where we were able to eat a meal while watching the movie, the food is nothing special, yet the concept rocks! Alex’s company recently held a silent auction where a donated $75 acupuncture session was up for bid. Knowing that I have been interested in the practice for awhile Alex bid on it for only $30 and won it! I called and made my appointment with Christine at Blue Heron Acupuncture and two weeks later there I was lying on a massage table in this woman’s home having her poke me with needles. Haha. Ok, it wasn’t as strange and creepy as I just made it out to be. Christine was incredibly welcoming and answered all my questions with ease and made sure that I had a relaxing and positive experience. The session started with me filling out a form of my health history, you know the drill, and we spoke about my sleep, eating, and exercise habits. I was deemed healthy and already very relaxed, which she said is great but I may not be able to feel the full benefits of acupuncture as most her patients are high-strung individuals with stressful jobs and who have sadly forgotten what it feels like to relax! I laid down on the table and relaxed as she lightly tapped the thin needles into certain pressure points, about 9 total. Did it hurt, you ask? No, but on a few of the needles I could feel a dull sting, in response she moved the needle a few millimeters from the current spot and re-tapped it in. Va bene. After the needles were assembled she placed a heat lamp over my feet (as they cool down significantly during the process), a blanket over my torso, and a scented eye mask over my eyes. Ambient noises of waves crashing was turned on in the background and I was left to relax for 30 min. So basically…naptime. While she was gone I would move body parts around to re-stimulate the needles and would in turn feel a numbness and heaviness in my muscles…slightly euphoric I would say. But nothing ground breaking. I guess if I had an ailment such as a sprained ankle or chronic back pain acupuncture would definitely be the way to go. For now I’ll stick to massages as I find them more rewarding. Christine explained to us on our way out the benefits of Eastern medicine and how she uses it for EVERYTHING from headaches to the flu. She also mentioned that she hasn’t used antibiotics for the past 25 years…wow. I would love that type of independence from American healthcare…at least for the small stuff. So along with my other new hobbies I’m wanting to educate myself more with Eastern medicine, I think it could really impact Alex and I in a very positive way!